The Caché .NET Object Binding  provides high-performance native object access to data using auto-generated proxy classes. These proxy classes correspond to persistent objects stored within the Caché database and provide object persistence, retrieval, data caching, and life-cycle management (see Using the Caché Object Binding for .NET). The Caché implementation of the ADO.NET Managed Provider  provides easy relational access to data using the standard ADO.NET Managed Provider classes (see Using ADO.NET Managed Provider Classes). This combination is unique in that it provides a .NET application with simultaneous relational and object access to data, using a common API and without requiring any object-to-relational mapping. The CacheClient assembly is implemented using .NET managed code throughout, making it easy to deploy within a .NET environment. It is thread-safe and can be used within multithreaded .NET applications. This section provides specifies requirements and provides instructions for installing Caché and configuring Visual Studio. Visual Studio 2008 or 2010. Visual Studio 2010 is required when using .NET 4.0. Caché is not required on computers that run your Caché .NET client applications, but they must have a TCP/IP connection to the Caché Server and must be running a supported version of the .NET Framework. The CacheClient assembly (InterSystems.Data.CacheClient.dll) is installed along with the rest of Caché, and requires no special preparation. If Caché has been installed with security level 2, open the Management Portal and go to [System Administration] > [Security] > [Services], select %Service_CallIn, and make sure the Service Enabled box is checked. If you installed Caché with security level 1 (minimal) it should already be checked. To use the CacheClient assembly in a .NET project, you must add a reference to the assembly, and add the corresponding Using statements to your code (as described in the following section, Configuring Visual Studio). 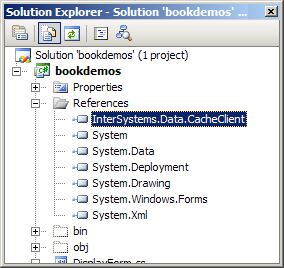 See Caché Installation Directory in the Caché Installation Guide for the location of <Cache-install-dir> on your system. All Caché assemblies for .NET are installed to the .NET GAC (Global Assembly Cache) when Caché is installed. Configuring a Visual Studio Project  describes how to add a CacheClient assembly reference and Using statements. Adding the Caché Object Binding Wizard to Visual Studio  describes how to add the Caché proxy class creation wizard to the Visual Studio Tools menu. Browse to the subdirectory of <Cache-install-dir>\dev\dotnet\bin that contains the assembly for the version of .NET used in your project (see Installation), select InterSystems.Data.CacheClient.dll, and click OK.
Add Using statements for the two main namespaces in the InterSystems.Data.CacheClient.dll assembly before the beginning of your application's namespace. Both the CacheClient and CacheTypes namespaces are included in the InterSystems.Data.CacheClient.dll assembly. 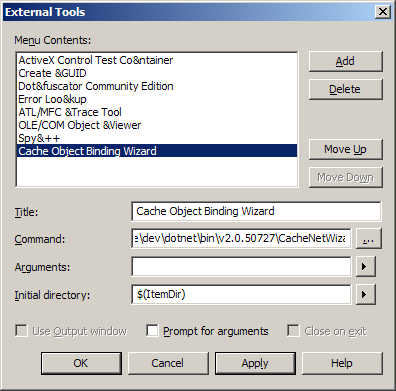 The Caché Object Binding Wizard is a program to generate Caché proxy objects (see Using the Caché Object Binding Wizard). It can be run from the command line, but will be more readily available if you integrate it into Visual Studio by adding it to the External Tools menu. 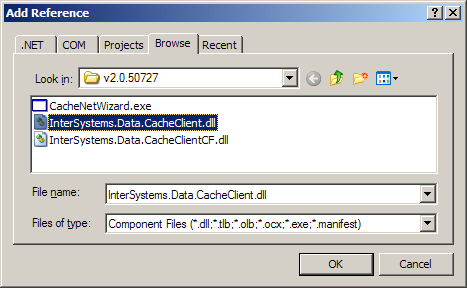 In the Command field, browse to the <Cache-install-dir>\dev\dotnet\bin\v2.0.50727 directory and select CacheNetWizard.exe. (Although this executable is located in the .NET 2.0 directory, it provides the Binding Wizard for all supported versions of .NET. For the location of <Cache-install-dir> on your system, see Caché Installation Directory in the Caché Installation Guide). 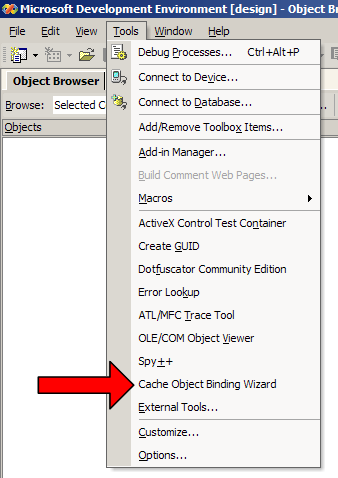 The Caché Object Binding Wizard now will be displayed as an option on the Visual Studio Tools menu. The Caché .NET binding gives .NET applications a way to interoperate with objects contained within a Caché server. These objects can be persistent objects stored within the Caché object database or they can be transient objects that perform operations within a Caché server. The Caché Object Server  a high performance server process that manages communication between .NET objects and a Caché database server using standard networking protocols (TCP/IP). Caché uses a common server for .NET, C++, Java, Perl, Python, ODBC, and JDBC access. The InterSystems.Data.CacheClient assembly  a set of .NET classes that implement all the functionality of the .NET classes created by the Caché Proxy Generator. It also provides a set of proxy classes for a few Object Server classes that are projected differently to make them fit into the framework of the .NET standard library. The Caché Proxy Generator  a set of methods that generate .NET classes from classes defined in the Caché Class Dictionary. Several different interfaces are available (see Generating Caché Proxy Classes). The Caché Proxy Generator creates .NET proxy classes that correspond to your Caché classes. These classes contain stub methods and properties that correspond to Caché object methods and properties on the server. At runtime, your .NET application connects to a Caché server. It can then create instances of .NET proxy objects that correspond to objects within the Caché server. You can use these proxy objects as you would any other .NET objects. Caché automatically manages all communications as well as client-side data caching. A .NET client application into which your generated and compiled .NET proxy classes have been linked. At runtime, the .NET application connects to Caché using an object connection interface (provided by the CacheConnection class). All communication between the .NET application and the Caché server uses the standard TCP/IP protocol. The Caché .NET help file provides the most current and detailed documentation for both object and relational APIs. Although the file is named CacheProvider.chm, it covers both ADO.NET Managed Provider classes (InterSystems.Data.CacheClient) and Object Binding classes (InterSystems.Data.CacheClient.ObjBind), as well as classes used by both bindings. CacheProvider.chm is available as a stand-alone help file in <Cache-install-dir>\dev\dotnet\help. Caché comes with a set of sample projects that demonstrate the use of the Caché .NET binding. These samples are located in the <Cache-install-dir>/dev/dotnet/samples/ subdirectory of the Caché installation (see Caché Installation Directory in the Caché Installation Guide for the location of <Cache-install-dir> on your system). adoform  A simple program to access and manipulate the Sample.Person database. The same program is presented in three different Visual Studio languages: C#, Basic, and C++. bookdemos  Contains complete, working versions of the examples in this document. The project is a small, easily modified test bed for short sample routines. All of the relevant sample code is in one file: SampleCode.cs. You may need to regenerate the ..\bookdemos\WizardCode.cs file, which contains proxy classes for the Sample package (see Generating Caché Proxy Classes for detailed instructions). console  A console program that demonstrates the bare minimum requirements for a Caché .NET project. mobiledevice  Similar to adoform, but demonstrates how the mobile version of the CacheClient assembly deals with transient connections. objbind  Similar to adoform, but demonstrates how to write code that uses both ADO.NET Managed Provider classes and Caché Object Binding classes in a complementary fashion. All of these projects use classes from the Sample package in the SAMPLES namespace. You can use Studio to examine the ObjectScript code for these classes. will fail because the root namespace has not been referenced. This can be easily corrected by disabling the "Root namespace" option in the Visual Studio project preferences.